Shock: The novice crew had miscalculated their new range-finder and the tank on their sensors was their own. The detector missiles swing back and destroy their target: The Juggernaut. Thoughts: A fascinating Future Shock for all sorts of reasons other than the story itself, although this classic version of the ‘problem of scale’ Future Shock, last seen dispatching an Alien spaceship in FS 3, is by no means bad. The Juggernaut is both impressively named and looking; with a ‘super-gun’ that would have put Saddam to shame. The fantastically monikered Hunter Tremayne only featured this one time in 2000AD as well as appearing in the long forgotten ‘Graphixus‘ (”The Adult Comix Showcase’ which also featured Bolland, Hunt Emerson and John Higgins) comics magazine before seemingly departing comics for literary fiction and writing plays. 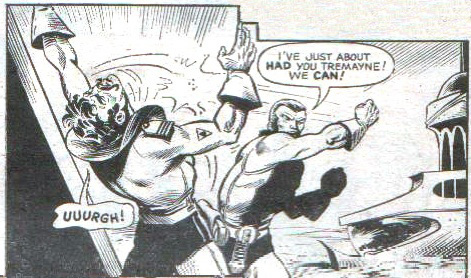 The script suffers from a bit too much ‘tell’ and not enough ‘show’, the whole initial duplicity against the smaller tanks is dealt with in exposition and some general ‘Juggernaut looking mean’ establishing panels rather than being played out in action but for a first attempt it doesn’t make a bad fist of its premise. More significantly the strip is also the first 2000AD appearance by iconic UK artist Garry Leach (VCs, Slaine, Dredd, A1) ; although the subs droid sadly misspelt his first name in the credits box. Leach came to 2000AD from art school and immediately turned in some unfussy but impressive work on this strip. The panel layouts go a bit awry in the final page and there is a dubiously sitting helmet on the hapless radar operator but the figure work is solid and an impressive variety of angles used in the composition. His style is also quite distinct at this early stage and, as with many of this emerging generation of talents, different to both the traditional British look and the European / S.American style of many early 2000AD artists. Also of note is that a year on from Bill Savage having to fight ‘Volgs’ instead of Russians, The Juggernaut is clearly a soviet machine with the Hammer and Sickle on proud display. This may be because the tank’s soldiers aren’t invaders, just incompetent. Shock’d? : The ‘other’ tank could indeed have been real opposition although failure to make more of The Juggernaut’s own duplicity against the smaller tanks means this is slightly underplayed. There is no real surprise when the ordnance turns back to destroy the tank but you do think they might have trained their troops a tad better.